Home / Resources / Why Ceramics? Many people ask: “Why chose a ceramic bearing to replace the original Porsche IMS bearing?” To answer this, there are a few important things to consider. First, many people do not know, but Porsche chose to use a ceramic bearing for their replacement IMS kit released in 2017, which uses a sealed 6204 ceramic hybrid bearing, with 52100 steel races and sintered silicon nitride balls. This comes a full decade after LN Engineering publicly released its first IMS Retrofit kit, using the same bearing Porsche utilizes. Second, prior to the introduction of a ceramic replacement IMS bearing, LN Engineering had great success with sintered silicon nitride engine components, specifically ceramic lifters (camshaft followers) made of the same material for Porsche and VW engines. These were a direct response to the industry wide camshaft and lifter failures being experienced as a result of lower quality camshafts and lifters coupled by the reduction of ZDDP in engine oils – the results were disastrous. Ceramic lifters eliminated cam and lifter wear and stopped all failures, regardless of what oil was used. That is why LN Engineering chose ceramics when it came time to find a solution to the IMS problem. Lastly, there is over a decade of proven performance to back up the fact that dual row ceramic bearings work, with zero failures reported for any LN Engineering IMS Retrofit with dual row bearings including the patented Single Row Pro, which allows a dual row bearing to be fitted in place of a factory single row bearing. So what exactly are ceramic bearings? Ceramic hybrid ball bearings use 52100 steel races with sintered silicon nitride (ceramic) balls. In the case of the IMS Retrofit, CERBEC balls are utilized. 52100 bearing steel is one kind of special steel with features of high wear resistance and rolling fatigue strength. High-carbon chromium bearing steel, engineering steel and some types of stainless steel and heat resistant steel are used as materials of bearings and for other purposes. Sintered silicon nitride balls are used in ceramic hybrid ball bearings. There are many benefits to these advanced ceramics over conventional steel balls, including no cold welding or adhesive wear, and with lowered centrifugal forces, ball-skidding is minimized. [1 Beyond spalling caused by mechanical overload which is commonly seen in original IMS bearings, adhesive wear and ball-skidding are commonly seen in worn or failing IMS bearings. Naysayers cite conventional bearings, whether roller or ball bearing, as a better choice for the IMS than a ceramic hybrid ball bearing, but those studies carried out by NASA are over 14 years old. Early ceramics did indeed have a shorter service life than bearings with conventional balls, but modern ceramic hybrid bearings with sintered silicon nitride balls have been proven to last anywhere from three to ten times longer, exceeding predicted life significantly, suggesting models for bearing life do not accurately match real world results of ceramic hybrid ball bearings. Silicon nitride is a chemical compound of the elements silicon and nitrogen. Si3N4 is the most thermodynamically stable of the silicon nitrides. It was not until the 1970s that manufacturing costs were reduced and the sintering process, which takes a slurry and under extreme temperature and pressure, allows shapes, like ceramic ball bearings, to be manufactured. The resulting material is highly resistant to abrasion and corrosion, with the highest fracture resistance of all ceramics used in manufacturing. Beyond engine, wheel, transmission, and clutch bearings, silicon nitride components have found their way into motorsports, medical, aircraft, and manufacturing. Specifically, it can be used in valve trains, rotors and stators in turbines, turbochargers, and even rockets, where few materials exist that can survive extreme conditions. Since their introduction in the 1960s and development carried out by SKF (MRC) in the 1970s, ceramics have improved greatly, eliminating concerns about reliability, with cost being their only limiting factor in implementation in applications where their wear resistance and reduced friction promote longer bearing life compared to conventional bearings. The first commercially available ceramic bearings were offered in 1984 and it was Koyo that pioneered the first practical application of silicon nitride in bearings. It is believed that automobile manufacturers will continue to utilizing silicon nitride as greater demands for increased fuel economy are mandated. In inspection of used original IMS bearings, it is common to see dented or flat spotted balls and signs of dragging or skidding. 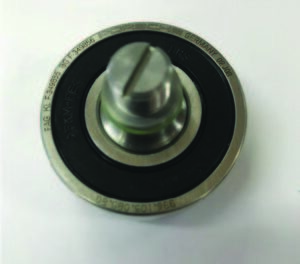 One of the benefits of a hybrid ceramic ball bearing is self-healing properties of a hybrid bearing. Those against the use of a sintered silicon nitride ball claim the hardness of the ceramic ball will lead to the races being dented by the load applied to the bearing by chain tensions, but in fact those studies claiming the higher Young’s modulus and hardness of the ceramic ball leading to dents is an artificial result of the testing method and not indicative of real world results. It is common to find ball bearings and roller bearings as being interchangeable for many applications. A dual row, angular contact ball bearing or roller bearing is suitable for radial loads, but the dual row, angular contact ball bearing is considered superior for axial and moment loads.The factory dual row IMS bearing as well as LN Engineering’s Classic Dual Row and Single Row Pro IMS Retrofit kits utilize dual row angular contact ball bearings, the latter being of ceramic hybrid construction. Conversely, Porsche’s 4-cam Carrera 547 engine utilized a roller bearing crankshaft and there was a brief attempt to use roller bearing crankshafts in Formula 1 engines, before the use of ceramic bearings were banned by the FIA. Although some claim that a roller bearing is stronger than a ball bearing, manufacturers such as SKF and NSK provide both static and dynamic load ratings for their bearings and it has been found that the roller bearings used in IMS kits that have similar load ratings to dual row ceramic hybrid ball bearings utilized in the IMS Retrofit. In fact, modern two- and four-stroke engines now commonly utilize ceramic hybrid ball bearing crankshafts instead of ones that use higher friction roller bearings, as ceramic hybrid roller bearings are still on a magnitude of ten times the cost of a similarly sized ceramic hybrid ball bearing. Single Row IMS Replacements: LN Single Row Pro Angular Contact Dull Row Ceramic Hybrid Ball Bearing (Left); RND RS Roller Bearing (Right). 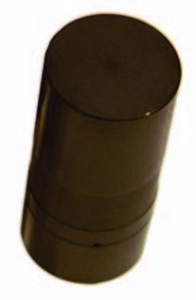 Both bearings have similar load ratings and lubrication requirements. 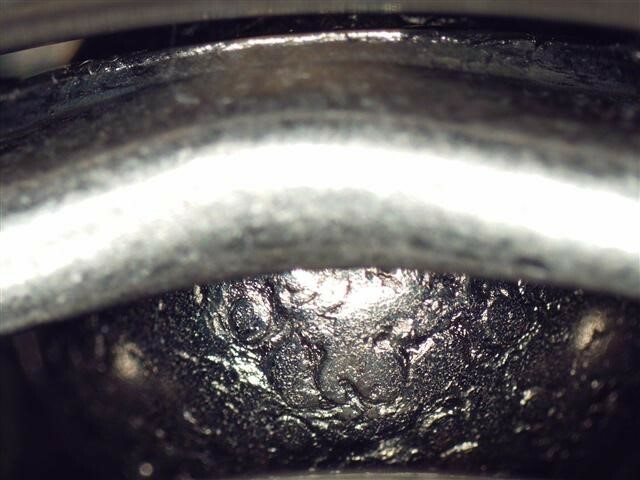 Some claim that lubrication, or the lack thereof, is the cause of IMS bearing wear and failures and that adding external oiling will prevent future failures, when the IMS is already partially submerged in oil. For those who do not know, the IMS is located in the bottom of the engine in the vicinity of the oil sump. With the grease seal removed, the oil level should be at the centerline of the lowest rolling element for proper lubrication, and that’s not even taking into account the ample oil mist contained within the crankcase during engine operation. Another explanation for the 8% failure rate on the factory single row bearing is that it has half the load capacity of the factory dual row bearing, which had only a 1% failure rate. Utilizing a ceramic hybrid ball bearing is the best choice for applications with poor lubrication is just another benefit as they excel in this application. SKF, a world leader in bearing technology, claims 14 times less wear for a ceramic hybrid ball bearing compared to a conventional, all-steel bearing, showing superior resistance to scuffing and smearing that lead to vibrations that can cause premature bearing failure. All major bearing manufacturers, Koyo, SKF, and NSK included, agree that ceramic hybrid bearings will provide longer service in most applications. These bearings benefit from reduced wear and cooler operating conditions, all while reducing required lubrication requirements over all-steel, conventional ball bearings. There are many choices when it comes to replacing your IMS bearing. For some, using a ball or roller bearing that will need future servicing will be the most cost effective option, where for others, utilizing a permanent fix like the IMS Solution which backdates the IMS bearing to a plain bearing, like in the Mezger engine, is the only choice. Although there are many choices including ball and roller bearing kits, knowing all the facts and understanding the technology are critical to making an informed decision as to which bearing technology to use.